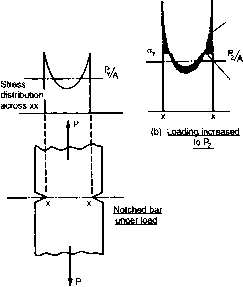 The fully plastic moment required in eccentric load conditions is therefore reduced from that in the simple bending case by an amount depending on the values of the load, yield stress, section shape and load factor. where P/A is the mean stress across the section assuming no stress concentration is present. When the load has been increased to a value Py, just sufficient to initiate yielding at the root of the notch or other stress concentration, the stress distribution will be as shown in Fig. 3.28(a). Since equilibrium considerations require the mean stress across the section to equal Py/A it follows that the stress at the centre of the section must be less than Py/A. If the load is now increased to P2, yielding will continue at the root of the notch and plastic penetration will proceed towards the centre of the section. At some stage the stress distribution will appears as in Fig. 3.28(b) with a mean stress value of P2/A. If the load is then removed the residual stresses may be obtained using the procedure of §§3.9 and 3.14, i.e. by superimposing an elastic stress distribution of opposite sign but equal moment value (shown dotted in Fig. 3.28(b)). 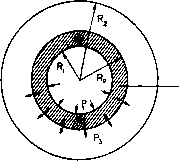 The resulting residual stress distribution would then be similar to that shown in Fig. 3.28(c). Fig. 3.28. Residual stresses at stress concentrations. Whilst subsequent application of loads above the value of P2 will cause further yielding, no yielding will be caused by the application of loads up to the value of P2 however many times they are applied. With a sufficiently high value of stress concentration factor it is possible to produce a residual stress distribution which exceeds the compressive yield stress at the root of the notch, i.e. the material will be stressed from tensile yield to compressive yield throughout one cycle. 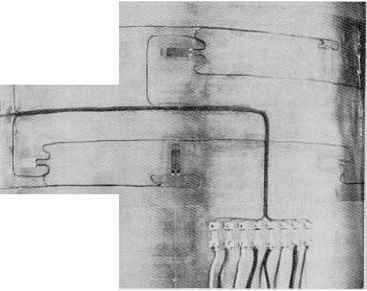 Provided that further cycles remain within these limits, the component will not experience additional yielding, and it can be considered safe in, for example, high strain, low-cycle fatigue conditions. Consider the thick cylinder shown in Fig. 3.29 subjected to an internal pressure Pi of sufficient magnitude to produce yielding to a radius Rp. but from eqn. (10.2),i, the equilibrium equation, dor oH-or — r— dr t J. Heyman, Proc. l.Mech.E. 172 (1958). W.R.D. Manning, High Pressure Engineering, Bulleid Memorial Lecture, 1963, University of Nottingham. $ EJ. Hearn, Mechanics of Materials /, Butterworth-Heinemann, 1997.